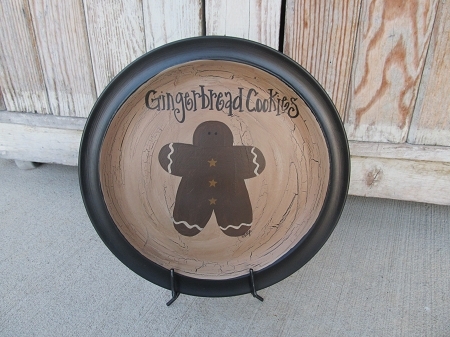 Primitive country hand painted Gingerbread plate. Great for your kitchen's year round decor or a fun seasonal accent. Up-cycled dinner plate has been transformed into this country decor piece. Not intended for food use. Rim color choices are available. Shown in Milk Chocolate Brown. Size varies but most are around 10" in diameter. Plate racks are not included but are available for purchase on the web site. Hand painted, designed and signed by Heidi. Featured in the November 2014 Country Sampler Magazine.